The documents gathered for this mini-edition chronicle Margaret Sanger's publication of the radical, feminist journal, The Woman Rebel, and her emergence as the foremost leader of the birth control movement. The events surrounding the publication of the journal in 1914, including Sanger's indictment for violation of federal obscenity laws, her unlawful flight from prosecution, her 13-months in exile in Europe, and her emotional return to New York in the fall of 1915 to face trial, trace the inception of the birth control movement in the U.S. and mark a pivotal time in Sanger's life. The Woman Rebel established Sanger as a dynamic and controversial feminist voice, the leading birth control agitator in America, and an influential international, a position she held for the next fifty years. 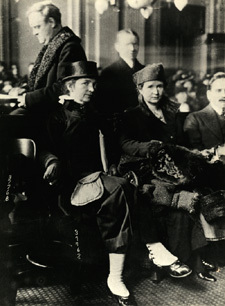 Margaret Sanger and Ethel Byrne at Federal Courthouse, 1916.